This month we interviewed Ean Mei Yap from Petaling Jaya. 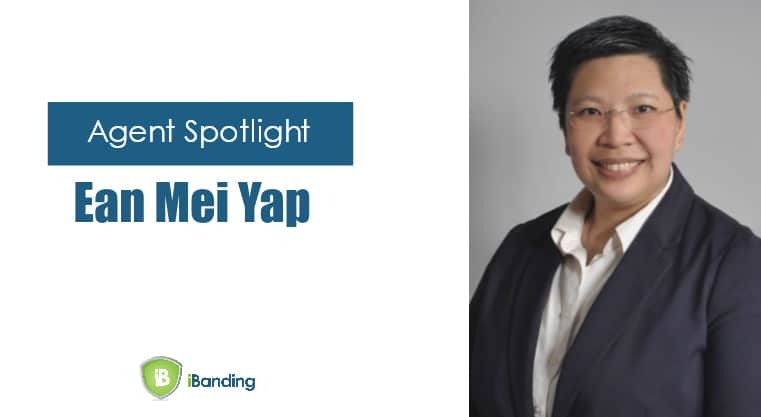 She shares with us her story, what made her decide to become a insurance agent and what Malaysians should watch out in their insurance policies. 1. iBanding: Please tell us your background. Yap: I was in the construction industry for the past 13 years since I’ve graduated. At that time the construction industry was booming. What we have been taught is that once you graduated, you should find a job in the same field as what you have studied, then you would just earn your way up and climb the corporate ladder. That was what I did. After 13 years in the industry, I knew my age was catching up, and realized that I was doing the same thing in and out every day. I have constructed everything, high rise, shop offices, shopping malls etc. I have basically experienced everything in the construction industry. I was thinking why not change industries. I like to do work that involves planning. When I was working in construction I did a lot of planning. Mostly planning for master schedule because I was a Project Manager. I wanted to be involved in planning. At the same time my insurance agent left, so I had no one as my insurance agent. My agency leader came and told me that she would take over. The second time we met, she asked about my job. She started to get to know me even more. I told her my job was quite successful but it can be stressful, especially when construction project is delayed or faces issues. I did earn a lot, however, to me a job has its limit. Once you have reached your limit and can’t go further, you’ll feel stagnant. As a lady I wouldn’t want to relocate overseas, like Dubai, London or elsewhere. I am so comfortable in my safe zone. I’m just stagnant there. Then, my leader suggested that I should try to work in the insurance industry. I wasn’t really into the idea as I thought I was not a good salesperson. She reassured me that an insurance agent shouldn’t think like a salesperson, but instead share what insurance is about and how insurance can help. I finally gave in and agreed to try it out part time. I passed the exam and my leader got me contracted. 2. iBanding: Do you specialize in a specific insurance type? Yap: Well as a life insurance agent we cover life as well as medical. I cover general insurance too, personal accident, travel insurance and motor insurance. But when you say specialty, I do a lot of Financial and Estate planning. 3. iBanding: What is Financial and Estate planning? Yap: Estate planning is when people plan for their inheritance. Will writing is one form of it. I prefer to use insurance to do the planning. It is also known as legacy planning. For example, let’s say that there’s a rich man who has 3 sons. He wants to buy a house for each sons for one million. I would ask him if he would like to get a life insurance instead of buying houses for each of his sons. Buying a house is not simple. You would have to pay stamp duty, down payment, settle loan, involve lawyers and so on. I would then suggest him to get life insurance cover for 3 million and pay a fraction of it in premium. There would be no down payment or anything else. It is less complicated and more flexible. When the time comes, his sons will get a million each, since the rich man have put them as beneficiaries. This is the fastest way to distribute the estate. 4. iBanding: So this would be a whole life or a term life insurance? Yap: Whole life and term life are old plans, now it is all investment-linked. They cover you up to 100 years old. For example, let’s say you get the plan up to 80 years old. There are 70, 80 and 100 years old plans. By the time you reached 80 years old or have surpassed it, you won’t get the 3 million. The 3 million is the death benefit. You may get around 70% of your premium paid when it matures. Of course the earlier you buy the plan, the lower the premium you are paying. Before I propose any plan to them, I would do fact finding about the client, find out what are his or her needs. Why does he/she need the insurance? What is it for? I don’t push the product the moment I meet a client. I first ask a few questions, do some fact finding, and see their needs. Maybe that person already has life coverage, but doesn’t have critical illness coverage. For instance, if your critical illness coverage is RM 20,000 but your life cover is a million ringgits, it is not balance and so it is not worth the coverage. It is better if these coverage are balanced, or the critical illness coverage is enough to cover the medical expenses, let’s say cancer. This is where I need to interview and do a plan for the clients. I don’t have the need to close a case immediately, because people will sense your urgency. Your purpose is to meet, get this person to be your friend, then he/she will know who you are, what you do, what is your expertise and to let he/she feel comfortable. 5. iBanding: What made you choose insurance as your career? Yap: Probably it’s because I like to share. Sharing is caring. One more thing is that the corporate life is stressful. After you reached a certain stage, you would want to do something different. In my opinion, when you are in the corporate life, you will not have much time for yourself. I have a few friends that like to do charity as well. Insurance is more like paying it forward. When you find someone with not enough insurance, you will try to get them covered. If you managed to get that person covered, you are actually helping their family and themselves to secure their family’s future. Frankly, I don’t read the newspapers anymore. It has been so many years because there are no real happy stuff. You will read an article like they’ll need donations for a surgery etc. That’s because they don’t have insurance. How much can you help? I don’t have RM200,000 or 2 million to help. The only way for me to help is by creating awareness. If you can’t afford a RM200 per month plan, at least take a RM100 per month insurance plan. It is not much, but at least you are covered first. Then you slowly top it up to better coverage when your client has increment in their salary and is better off. I do reviews every year. I meet my clients every year and check on them, try to convince them to review and gradually increase the amount of coverage. We want to make insurance sustainable. My mission is just to go out and get everyone covered. This is because Malaysia’s insurance penetration rate is only 54%. Within that 54%, there are those who are underinsured with coverage of below RM50,000 sum insured. 46% of Malaysia’s population has zero coverage. Our government stated that by 2020, the nation should get at least 75% penetration rate for insurance. It is up to every insurance agent, regardless of which company, to get everyone covered and to create awareness. There was one incident that happened to my friend’s relative that also made me pursue this industry. It took her 20 years to save up RM300,000 cash. One unfortunate day, she discovered that she had breast cancer and had to use up the RM300,000 in one year. It is so heartbreaking. She had no insurance. If she had an insurance, she would still have her savings. 6. iBanding: What are the biggest mistakes Malaysians make in buying insurance? Yap: Procrastination and not knowing what they buy. They like to procrastinate. If you can predict when accidents happen, then by all means delay it. The fact is that you don’t know what’s going to happen. They will compare the prices. Insurance companies are now going for price war but not Prudential. Prudential may not be the cheapest, but our value is there. It’s like our motto saying “Always listening, always understanding”. Metaphorically speaking we all drive cars, but why does some choose to drive Mercedes, Honda or Proton? Because it is all about the value, in terms of comfort, quality and so on. The same goes for insurance. Therefore, it is wise to choose the company that gives you better value as your insurance provider. A lot of people who are insured do not know what they are paying for. They don’t know how much they are covered. Sometimes it is quite frustrating. They want to cut or terminate their insurance because they don’t know how much they are covered. When I do fact finding, I would tell the client to bring out all of their policy. My strength is policy review. Regardless from which company, I will do a summary for the client on what is their coverage and how much they will be paying and I will tell them what are their current expenses. For example, let’s say your coverage now is RM30,000, it won’t be enough. A surgery alone costs about RM80,000. That other RM50,000 has to come out from your own pocket. This is when I will come up with a plan for you. In addition, you can have two medical cards. Once you have finished one limit, you can transfer the limit to the other card, so you can use both. It depends, it can also be consolidated. It works the same. I would not force my clients, it is their choice. Since they are paying for it, they are the ones to decide whether to consolidate or have two separate policies. 7. iBanding: For car insurance, what are the most common mistakes Malaysians make during an accident? Yap: Usually people will panic when accidents happen. Of course that’s normal, they get terrified. But what makes it bad is that they will not remember the motor assist number. They’ll call their friends or whoever and call for a tow truck. There is an extra cost already. I would always tell myself and my clients to save important numbers or download apps. Whenever you need a tow truck, just click on an app, the towing is free too. Thank you very much Yap for the time and wisdom you have shared with us. If you have any question or would like to know more about Yap, you can check out his agent listing. Bulan ini kami menemubual Ean Mei Yap dari Petaling Jaya. Beliau berkongsi cerita beliau dengan kami, apa yang membuat beliau memutuskan untuk menjadi ejen insurans dan apa yang rakyat Malaysia patut perhatikan dalam polisi insurans mereka. 1. iBanding: Ceritakan sedikit tentang latar belakang anda. Yap: Saya bekerja di industri pembinaan selama 13 tahun setelah habis belajar. Masa tu industri pembinaan sedang berkembang. Selama ini kita diajar, bahawa setelah habis belajar kita kena cari kerja di bidang yang kita pelajari. Dan lepas itu, kita perlu usaha dalam mendaki tangga korporat di situ. Itu lah yang saya lakukan. Tapi setelah 13 tahun saya sedar usia saya sedang meningkat, dan sedar bahawa saya hanya melakukan benda yang sama setiap hari. Saya sudahpun bina segalanya, dari bangunan mencapai langit ke rumah kedai, ke kompleks membeli-belah. Saya telah punyai segala pengalaman yang perlu dilalui di bidang pembinaan. Saya mula fikir untuk bertukar bidang. Saya suka bidang perancangan. Semasa di bidang pembinaan saya banyak terlibat dalam membuat perancangan. Sebagai pengurus projek saya banyak buat master schedule. Jadi saya ingin tetap terlibat dalam pengurusan perancangan. Pada masa itu ejen insurans saja berhenti sebagai ejen dan diganti oleh ejensi leader. Kali kedia kami berjumpa, dia mula bertanya tentang kerja saya dan mula mengenali saya lebih mendalam. Saya bagitahu bahawa kerjaya saya agak berjaya tetapi ianya banyak memberi tekanan. Terutama sekali jika projek pembinaan tergendala atau mempunyai masalah. Memang pendapatan saya lumayan, tapi kerja perlu ada batasannya. Setelah kita mencecah satu peringkat umur dan kita sedar kita sudah tak boleh ke mana lagi, kita akan rasa tersangkut. Sebagai seorang wanita saya pula tidak mahu dipindahkan ke luar negara seperti Dubai atau London. Saya tidaklah muda lagi dan saya pula selesa di tempat saya. Jadi saya memang rasa saya sudah tersangkut. Kemudian ejensi leader itu cadangkan saya agar mencuba bidang insurans. Mulanya saya tidak rasakan ianya idea yang bagus sebab saya tidak rasa saya ni seorang jurujual yang bagus. Dia beritahu saya bahawa ejen insurans tidak perlu berfikiran seperti jurujual tetapi fokusnya pada berkongsi ilmu tentang kepentingan insurans dan bagaimana ia dapat membantu orang ramai. Akhirnya saya setuju untuk mencuba secara part-time. Saya lulus ujian dan saya telah ikat kontrak bersama ejensi leader saya. 2. iBanding: Apakah pengkhususan anda dalam bidang insurans ini? Yap: Sebagai ejen insurans hayat, kami menjual kedua-dua insurans hayat dan perubatan. Tetapi saya juga menjual insurans am, polisi kemalangan peribadi, insurans perjalanan dan insurans motor. Tetapi kalau nak kira pengkhususan, saja lebih fokus pada pengurusan kewangan dan hartanah. 3. iBanding: Terangkan sedikit tentang pengurusan kewangan dan hartanah. Yap: Ianya lebih kepada pengurusan pewarisan, seperti wasiat. I lebih gemar menggunakan insurans untuk merancangkannnya. Ia juga dikenali sebagai perancangan legasi. Contohnya, katakan seorang kaya mempunyai 3 orang anak lelaki. Dia ingin beli rumah kepada setiap orang anaknya yang bernilai RM 1 juta sebuah. Saya akan bertanyakan sama ada dia ingin membelikan insuran hayat sebalik membeli rumah. Pembelian rumah tidak mudah, anda perlu bayar duti setem, down payment, libatkan peguam, bayar balik pinjaman dan sebagainya. Saya akan nasihatka agar dia membeli insurans hayat bernilai RM 3 juta dan bayar hanya sebahagian darinya dalam bentuk premium. Tiada down payment atau bayaran muka dan sebagainya. Ia lebih mudah dan fleksibel. Apabila tiba masanya, anak-anak beliau akan mendapat 1 juta setiap orang jika orang kaya itu telah meletakkan mereka sebagai pewaris. Ini cara paling cepat untuk membahagikan harta. 4. iBanding: Jadi adakah ini polisi seumur hidup atau bertempoh? Yap: Polisi seumur hidup dan bertempoh adalah pelan lama, sekarang ini semuanya investment-linked, atau polisi berkaitan pelaburan. Ianya melindungi kamu sehingga umur 100 tahun. Terdapat pelan 70, 80 dan 100 tahun. Katakan kamu ambil pelan 80 tahun. Apabila kamu cecah usia 80 tahun, kamu tak dapat 3 juta itu sebab ianya manfaat kematian. Kamu akan dapat sekurang-kurangnya 70% daripada premium yang kamu telah bayar apabila ianya matang. Dan semestinya, lebih awal kamu beli pelan tersebut, lebih murah premiumnya. Sebelum saya mencadangkan produk, saya selalunya akan buat kajian fakta dahulu bagi pelanggan saya untuk memahami keperluan mereka. Kenapa mereka perlukan insurans? Apa tujuannya? Saya tidak akan terus mengesyorkan sesuatu produk apabila berjumpa prospek. Saya bertanyakan beberapa soalan dahulu. Mungkin beliau sudah ada polisi hayat, tetapi tidak memiliki pelan perubatan. Contohnya jika perlindungan perubatan kamu adalah RM 20,000 tetapi perlindungan pelan hayat ialah 1 juta, ianya tidak sekata. Lebih baik jika perlindungan kamu lebih seimbang, jika perlindungan perubatan kamu cukup untuk menampung kos rawatan penyakit seperti kanser katakan. Maka di sini saya perlu betul-betul memahami keperluan pelanggan dan buat perancangan untuk mereka. Saya tidak tergesa-gesa buat sales, orang selalunya boleh rasakan kedesakan kita. Bagi saya, tujuannya ialah untuk bertemu prospek, mengenali mereka, dan biar mereka juga mengenali kita supaya mereka tahu siapa kita dan apa yang kita lakukan untuk mereka, kepakaran kita supaya mereka boleh selesa dengan kita. 5. iBanding: Mengapa anda memutuskan untuk menjadi ejen insurans? Yap: Mungkin sebab saya suka berekongsi. Bak kata orang, sharing is caring. Juga sebab kehidupan di dunia korporat banyak memberi stress. Setelah kita mencecah sesuatu peringkat, kita mula ingin mencuba sesuatu yang berlainan. Bagi saya, bila di dunia korporat, kita tak punya banyak masa untuk diri sendiri. Saya ada beberapa kawan yang suka melakukan aktiviti jariah. Saya merasakan insurans begitu juga. Apabila kita bertemu seseorang yang tidak memiliki perlindungan secukupnya, kita bantu dia untuk dapatkan perlindungan secukupnya. Jika berjaya, kita sebenarnya membantu beliau dan keluarga beliau mengukuhkan kewangan keluarga mereka di masa hadapan. Saya sudah lama tak membaca suratkhabar kerana ianya tak membawa apa-apa berita gembira. Kita sering baca berita tentang mereka yang perlukan sumbangan dana untuk pembedahan dan sebagainya. Ianya sebab mereka tiada insurans. Berapa banyak yang kita dapat sumbangkan? Saya tak memiliki RM 200,000 atau RM 2 juta untuk membantu. Hanya satu cara saya boleh membantu iaitu dengan memberi kesedaran. Kalau kita tak mampu dapatkan pelan RM 200 sebulan, sekurang-kurangnya dapatkan pelan RM 100. Ianya dapat juga beri sedikit perlindungan. Kemudian tambah perlahan-lahan apabila dapat pendapatan lebih. Saya lakukan penyemakan setiap tahun untuk pelanggan saya. Saya periksa kedudukan mereka dan jika perlu nasihatkan mereka agar menambahkan jumlah perlindungan mereka perlahan-lahan. Kita ingin insurans menjadi mampan. Misi saya ialah untuk keluar ke sana dan dapatkan perlindungan untuk semua. Ini kerana kadar penembusan insurans in Malaysia hanya pada 54%. Dalam 54% itu pula ada yang tidak mempunyai perlindungan yang mencukupi, di mana perlindungan kurang RM50,000. 46% rakyat Malaysia tidak mempunyai perlindungan. Kerajaan kita telah mengumumkan menjelang 2020, kita sepatutnya mencapai sekurang-kurangnya 75% kadar penembusan insurans. Jadi terpulanglah pada ejen, tidak kira apa juga syarikat, untuk mendapatkan perlindungan dan melahirkan kesedaran bagi seramai mungkin penduduk Malaysia. Terdapat suatu pengalaman yang dialami oleh rakan saya yang juga membuatkan saya bertukar ke bidang ini. Rakan saya menabung selama 20 tahun untuk mendapatkan simpanan sebanyak RM 300,000. Satu hari dia disahkan menghidap penyakit kanser payudara dan menghabiskan RM 300,00 dalam masa satu tahun. Amat menyedihkan. DIa tidak memiliki insurans. Jika tidak, pasti dia masih mempunyai simpanannya hari ini. 6. iBanding: Pada pendapat anda, apakah kesilapan terbesar rakyat Malaysia lakukan yang melibatkan insurans? Yap: Mereka berlengah-lengah dan mereka juga tidak tahu apa yang perlu dibeli. Mereka suka berlengah. Kalau kita boleh menentukan masa depan, tak kisahlah berbuat demikian. Tapi hakikatnya kita tak tahu apa yang akan berlaku. Pelanggan akan buat perbandingan harga. Syarikat insurans sedang melalui perang harga sesama mereka, tetapi tidak Prudential. Prudential memang bukan yang termurah walau bagaimanapun nilainya amat baik. Seperti motto kami yang berbunyi: Sentiasa mendengar. Sentiasa memahami. Contohnya kita semua memandu kenderaan, tapi kenapa ada yang memilih Mercedes dan ada pula yang memilih Honda atau Proton? Semuanya disebabkan oleh nilainya kepada kita, dari segi keselesaan, kualiti dan sebagainya. Jadi ianya lebih bijak jika kita memilih syarikat insurans yang menawarkan nilai yang lebih. Ramai yang mempunyai insurans tidak pula tahu apa yang dilindungi oleh polisi mereka. Adakalanya ianya amat mengecewakan. Mereka ingin menamatkan polisi mereka kerana mereka tidak tahu jumlah perlindungan polisi mereka. Bila saya melakukan pencarian fakta, saya akan meminta pelanggan untuk keluarkan polisi mereka. Kelebihan saya ialah dalam membuat penyemakan. Tidak kira polisi dari mana syarikat sekali pun. Saya akan buatkan kesimpulan bagi pelanggan tentang jumlah perlindungan mereka, berapa jumlah yang mereka perlu bayar dan saya akan beritahu mereka apakah kos mereka sekarang. Contohnya, katakan lah perlindungan kamu ialah RM 30,000. Itu tidak memadai. Pembedahan saja berjumlah RM80,000. Selebih RM 50,000 itu kamu kena tanggung sendiri. Di sinilah saya akan mencadangkan pelan untuk kamu. Kamu juga boleh memiliki dua kad perubatan. Jika satu telah mencapai hadnya, kamu boleh guna yang satu lagi. Atau kedua-duanya boleh digabungkan. Jadi kamu boleh menggunakan kedua-duanya. Saya tak memaksa pelanggan saya. Itu pilihan mereka. Kerana merekalah yang membayar untuk polisi mereka, mereka boleh memutuskan untuk menggabungkan atau untuk memiliki 2 polisi berasingan. 7. iBanding: Bagi polisi kenderaan, apakah kesilapan yang paling biasa dilakukan rakyat Malaysia semasa kemalangan? Yap: Selalunya mereka akan panik apabila berelaku kemalangan. Itu biasa, mereka jadi cemas. Tapi apa yang buruknya ialah mereka terus lupa nombor bantuan kemalangan. Sebaliknya mereka menelefon rakan dan perkhidmatan tow truck. Ini kos tambahan kepada mereka. Saya sering ingatkan diri dan pelanggan saya untuk simpan nombor penting dalam phone atau download app. Bila saja perlukan tow truck, klik saja di app, perkhidmatannya percuma. Kami berterima kasih kepada Yap kerana sudi luangkan masa bersama kami. Jika anda ingin menghubungi beliau untuk keterangan lanjut atau nasihat tentang insurans, sila ziarahi profil beliau di direktori ejen kami.